Nadia Nadim made it two goals in two games since signing for Manchester City, who reached the final of the FA WSL Continental Tyres Cup with a deserved 1-0 victory over Chelsea. 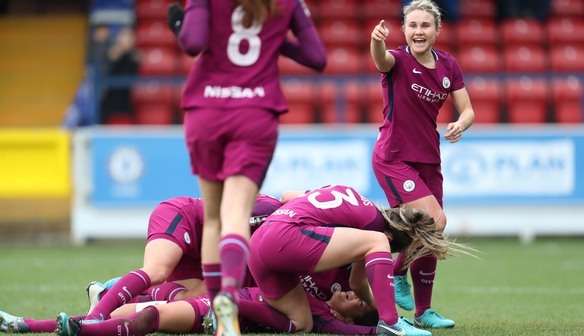 In what was the first meeting of the season between the two favourites for the WSL1 title, it was holders City who kept alive their hopes of emulating Arsenal's 'quadruple' of 2007. Chelsea had the game's first clear chance when Ji So-Yun laid the ball across goal for Fran Kirby, who was denied by a superb goal line clearance from Steph Houghton. Manchester City then went straight up the other end and went ahead when Jill Scott's low cross from the right was turned in from close range by Denmark international Nadim. Nikita Parris came close to doubling City's advantage before half-time when she was put through by Nadim, but onrushing Chelsea 'keeper Hedvig Lindahl made a brave block. The visitors continued to look the more threatening early in the second half, with Nikita Parris curling a shot over from the edge of the area. Chelsea sub Jonna Andersson then carved out a huge opening as she played the ball across goal after beating Abbie McManus, only for Karen Bardsley to brilliantly deny Hannah Blundell. Parris had another chance to make the game safe for City after being found in space by Nadim, but she shot wastefully over. A disappointing day for Chelsea was summed up in stoppage time as Millie Bright somehow failed to turn in Erin Cuthbert's cross from a couple of yards. "In a big game like this that's going to be as close as it was, you can't afford to miss those chances. "I think we put a good shift in today - they're a great team, we knew it was going to be a tough game and I think we competed with them. "I'm sure it was a great game for the spectators to watch and I think it's promoted women's football in a great way. "We're disappointed that we've lost and we know we can work on some things and move forward from that. "I think you were looking at two quality teams playing out there and hopefully it was a great advert for the women's game. "It was always going to be a tight game, there weren't going to be that many goals and it was about whoever took their chances. "If you don't take your chances you don't win the game." "Reaching another cup final is brilliant, it's what we want to do and what we want to continue to do. "We want to keep pushing and continue to be up there with the best, so we're moving in the right direction. "It was a hard game but it was top draw from every single player. "We knew it was going to be a hard game, we had a game plan and we knew what we had to come out and do and I think we did it pretty well. "Those last few minutes were really tough, but it's important to stay in it and not get too emotional. "The crowd got louder and it was just important to be logical, stick to the basics and stick to your game plan. "Chelsea are a big team and they were coming out all guns blazing so yes it feels good, but it means nothing if we don't go on to win the final."